These portraits are valuable records that document Native American dress and customs at the end of the nineteenth century during an active period of Indian removal and hostilities against Native Americans.Library of Congress holds one of the most important collections of Native American photographic portraits. [Unidentified Native American man] / Schreiber & Sons, photographers, 818 Arch St., Philad. 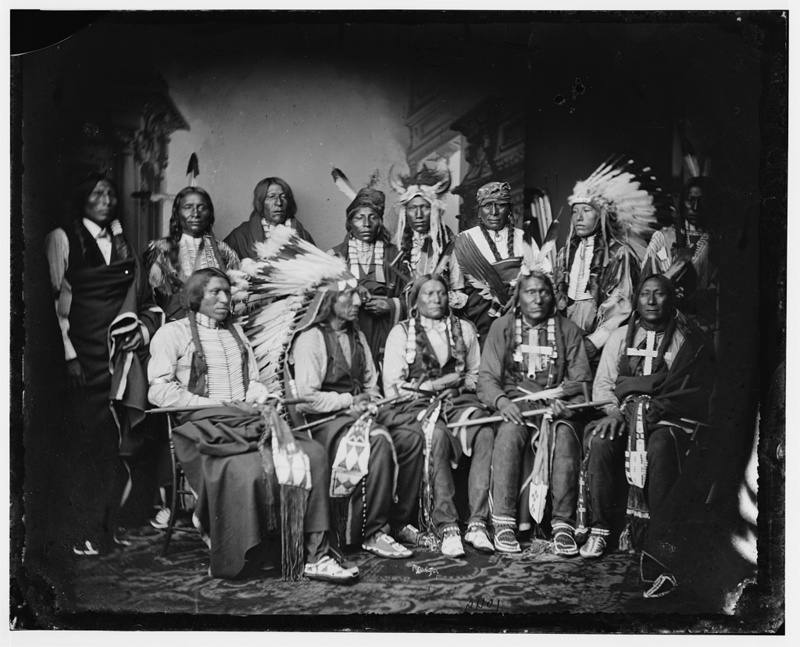 Group of Sioux Indians "Spotted Tail" (photo c. 1875) Standing: Joe Merrivale; Young Spotted Tail; Antoine Janis; Seated: Touch-the-Clouds; Little Big Man; Black Cool; last two are rapoves[?] indentified by George E. Hyde 4229 Dangler[?] St. Omaha, Neb. [Three Winnebago men, full-length portraits, seated, facing front] / photograph by W.H. Illingworth. [Two Winnebago men, full-length portraits, seated] / photographed by W.H. Illingworth. [Composite of photographs: full-length portrait of Chief Seattle, half-length portrait of Angeline, and views of Mt. Rainier and Seattle, Wash.] / Boyd and Braas photo. Capt. Geo Sword, chief of police with Buffalo Bill's Indians, Pine Ridge Agency, S.D. / W.R. Cross, portrait & view photographer, ... Hot Springs, S. Dak. Members of Lakota or Sioux tribe in predominantly traditional dress, posed with police chief in uniform. [Young Man Afraid of His Horses, half-length portrait, seated, facing slightly left, holding hat] / J.N. Choate, Carlisle, Pa.
[Red Cloud, Oglala division of Lakota, Sioux, head-and-shoulders portrait, facing right wearing suit] / Trager and Kuhn, Chadron, Neb. Rain-In-The-Face. (Sioux Indian) / A. Zeese & Co., Chi. Rain-In-The-Face, half-length portrait, facing slightly right, in traditional Sioux costume. Full-length portrait of a Nez Percé man, facing front. Indian child in bone breast plate. [Sauk Indian family, full-length portrait] / F.A. Rinehart, Omaha. American Indian man, probably a member of Buffalo Bill's Wild West Show, bust portrait, facing front, wrapped in blanket. Flying Hawk, probably a member of Buffalo Bill's Wild West Show, half-length portrait, turned right, facing front. Iron White Man, probably a member of Buffalo Bill's Wild West Show, half-length portrait, facing front, wearing headdress and a Buffalo Falls Police star-shaped badge. [Mary Martin, Indian, three-quarter length portrait, seated, facing slightly left, holding cradleboard] / Heyn & Matzen, Chicago. Iron White Man, half-length portrait, facing front. Chief Iron Tail, half-length portrait, facing front, wearing breastplate. Holy Frog(?) and Big Turnips (? ), probably members of Buffalo Bill's Wild West Show, half-length portrait, one wearing a headdress. Kills Close to the Lodge, half-length portrait, turned right, facing front, wearing breastplate and headdress. Chief Lone Bear, half-length portrait, facing right, wearing breastplate and warbonnet, holding bow and arrow. Face of Sioux Indian, forehead and chin covered by blanket, facing front. [Chief Revenger, head-and-shoulders portrait, facing front] / photo by Heyn and Matzen.